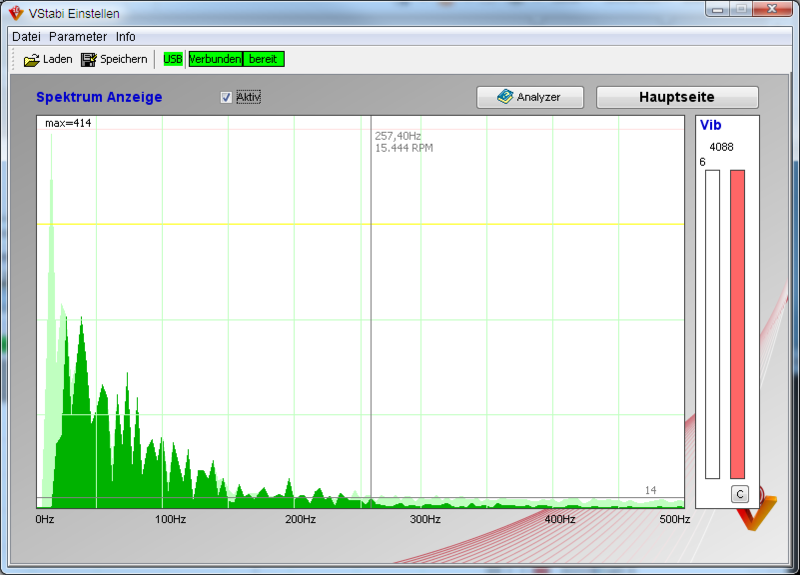 The vibration analysis tool shows the signal spektrum measured by the sensor. Vibrations are oscillations that may occur at different frequencies at the same time. A vibration "signal" can carry not only one frequency but different ones. This set of frequencies is called "spectrum". The calculation is done every two seconds, and is based upon a signal sample of 0.1 seconds. The display refreshes continuously. While moving the mouse pointer along the diagram, the cross hair shows the frequency in Hz at a certain position and calculates the corresponding rpm simultaneously. This way, vibrations can be related to rpm at certain rotating parts of the heli, such as main rotor, tail rotor, motor etc. My T-rex 450 has some strange vibrations after rebuilding it (crash due pilot error). This could be seen on a moving rotor disc while the heli has been running on the ground. In addition to this the tail fin was oscillating and some noise could be heared too. As first step it is always recommended to do a test run on the bench without main and tail blades. During this we can see things like uneven shafts or broken bearings. At the next step i took a look at the tail. Here we have 2 possibilities, either the tail hub including the blade grips or the tail shaft itself seems to be the problem. I had a new tail shaft handy and tried this first, it tooks the peak down a lot now. After mounting the tail blades we have more load in the system, the motor has to work more and causes also some vibrations. This can be seen as "grass" at the bottom here because the frequency is out of the sensors measurement resolution. Now i know that the motor might be a possible reason for vibration issues. As i had seen no further issues like moving swash plate servo horns on the bench here, so I wouldn't go on to balance/change the motor and keep it as it is. All has been done now, defective parts have been sorted out and replaced, the system is balanced as best as we can now. Some vibrations will be left of course but not as much as they disturb the control loops. We got huge improvements here and the heli flies much better now.